Welcome to another post in our monthly overview of our P2P recovery stages. Here, we’ll show you exactly how many loans are in each stage of the recovery process and we will compare how it has changed from month to month. While we have tried to assign all loans to a specific stage as of the date of the report, the recovery stages are sometimes not promptly updated so individual loans may occasionally fall under incorrect stages. Where do the figures stand? In case you missed our previous P2P recovery posts, you might firstly find it useful to check out our 3 step collection and recovery process. This explains everything you need to know about each stage and sub stage you see above. Soon, we aim to improve the view and reporting on your Bondora account so you can see all the information about what stage your loan is at in the recovery process along with a reminder of what happens at each stage. 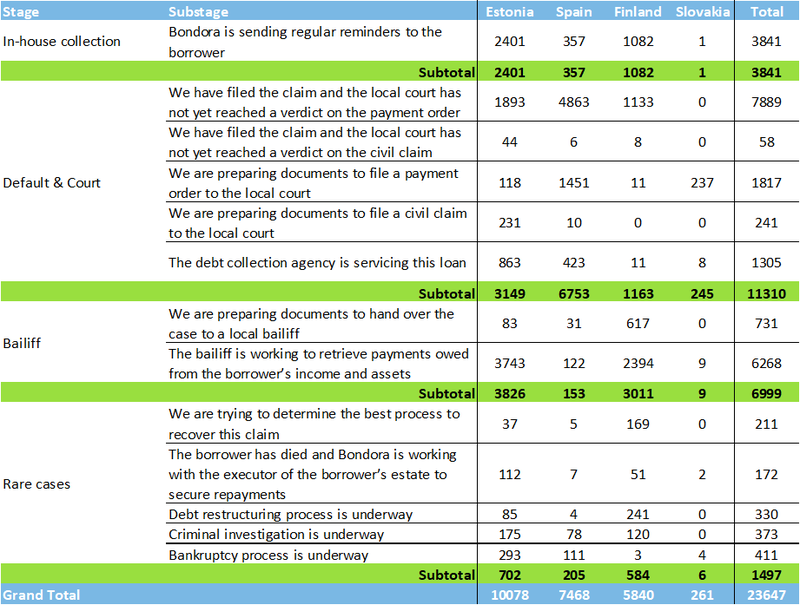 Last month, a total of 716 (+9.98% increase) new cases moved into the ‘We have filed the claim and the local court has not yet reached a verdict on the payment order’. After the court has given a final verdict and if this is successful, the case will move to the bailiff stage. In July 2018, the number of cases Stage 2 (Default and Court) increased by 4.89% (+525). Over half of this increase was in Estonia at 9.68% (+278). When a claim is filed to a court via a payment order, it takes a minimum of 4 months for them to reach a verdict and can take longer depending on their total work load, available staff and processing speed. As a reminder, a payment order is our first interaction with the courts and is a simple, fast and cost-effective process that accounts for the majority of our court cases. If the payment order does not bring any results or if the borrower objects to this, we then file a civil case. Once the courts have reached a decision on these cases (and if they are ruled in our favor), then they will move to the bailiff stage where the bailiff will begin to work to generate a cash flow and return payments to investors. Why is the bailiff stage important? This is a critical step in the recovery process for a number of reasons, most importantly because the bailiff has the rights to freeze the debtor’s assets and accounts to cover the payments owed. Once successful, this stage is usually where a cash flow is generated and you will start to see payments come in to your Bondora account. Check in again next month to see how the P2P recovery figures from August weigh up.